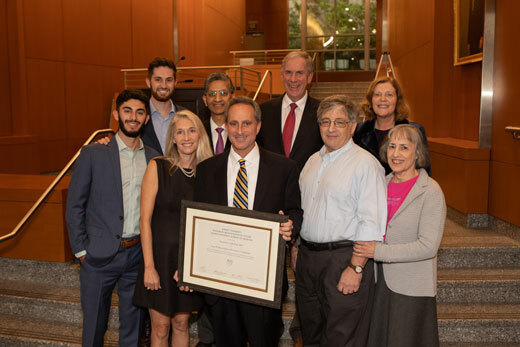 The Katz Professorship in Preventive Cardiology dedication held on Thursday, Oct. 25 did more than recognize the commitment of Laurence Sperling, MD, to Emory and the field of preventive cardiology. It was a celebration of philanthropy and the partnerships that make Emory a world-class academic medical center. Vikas P. Sukhatme, MD, ScD, dean of Emory University School of Medicine, illustrated the breadth of giving from the Katz family by asking those in attendance who held positions funded by the Katz Foundation to rise. Those standing were professors and fellows who represented the School of Medicine but were a shining example of the foundation’s impact on Emory. Sperling, who is also the founding director of preventive cardiology at Emory Clinic and co-director of the Cardiovascular Disease Fellowship Program, echoed President Sterk’s remarks about giving from the heart, recollecting his own relationship with Emory, which began in 1981 when he was an undergraduate. He recounted watching Emory’s cardiology program, “the first academic training program in the country with a focus on preventive cardiology,” grow as the result of philanthropy. For an example of what he meant, he asked to recognize members of the Katz Preventive Cardiology Fellowship Program who were in attendance.